Bang & Olufsen launches extraordinary new wireless speaker: the BeoPlay A9 | What Hi-Fi? 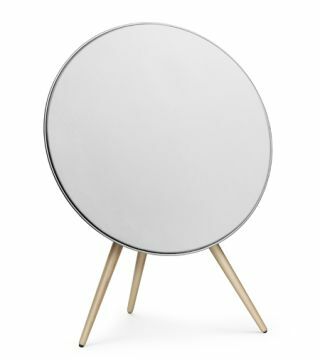 Bang & Olufsen sub-brand B&O PLAY (where Bang & Olufsen ideas go to be made more affordable and youthful) has launched its latest wireless sound-system: the BeoPlay A9. Looking not unlike an elegant, well-turned-out satellite dish, the A9 features an 8-inch woofer, two 3-inch midrange drivers and two 3/4-inch tweeters, each powered by individual class-D amplifiers – the woofer is treated to 160 watts of power, while the other four drivers receive 80 watts each. Connectivity extends to AirPlay or Bluetooth via a free BeoSetup app, or by using the USB socket. Control is via the app or by using the integrated capacitive sensor. The A9 has a dedicated DSP alogorithm, something B&O's calling Adaptive Bass Linearisation, which allows positioning either on the floor/table-top using the screw-in wooden legs or on the wall. This being a B&O product, there are a number of options in colour and finish: seven, in fact, for the fabric and three for the legs. The BeoPlay A9 goes on sale next month, and is expected to cost £1700.